Patricia D e Guzman holds a diploma of Health Science in Massage Therapy obtained through TAFE NSW. She is a member of AMT (Association of Massage Therapists Ltd). 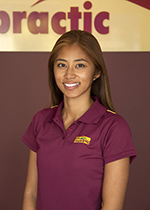 Patricia’s massage treatments are based on remedial/deep connective tissue techniques which are used to target knots, muscle tension and eliminate scar tissue. She will help aid recovery by incorporating Swedish and remedial massage techniques with the benefit of trigger point therapy, to treat your condition helping you feel relaxed and a sense of wellbeing. Patricia enjoys the first-hand experience with a chiropractor as a learning tool and interest for further study. When Patricia is not working, she enjoys jogging, biking, going to the gym and trying new activities.